It is enthroned on the once highest hill, Analamanga, at 1462 m with a view over the whole city: The Royal Palace or simply Rova (this is the Malagasy word for palace) of Antananarivo. It is located in the central highlands in the middle of Madagascar’s capital on one of the twelve sacred hills of the Merina. The first buildings of the palace complex were built in 1610 under King Andrianjaka, after he had ingested the hill according to legend with the mere presence of his thousand soldiers. Accordingly, he named the city at the foot of the hills Antananarivo, the city of a thousand. Under Andrianjaka’s reign, the Rova complex consisted of three houses: A small royal house, the Masoandrotsiroa (in English “there are no two suns”) and the Besakana (in English “very wide”). The latter is said to have been the royal house in which Andrianjaka lived and ruled. In addition there were later grave houses, the so-called Trano masina fitomiandalalana, translated “seven holy houses in one line”. 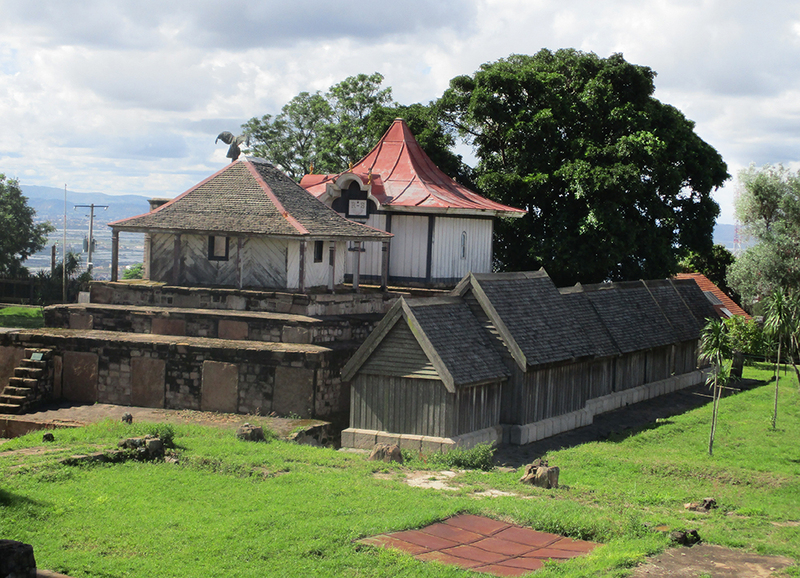 King Andrianjaka’s own tomb was the first to be built after his death. The tomb houses were intended to provide a good home for the spirit of the deceased and to make him sympathetic to the living. Ancestor worship is still widespread in Madagascar today and no one wants to attract the envy of their ancestors. Under the following kings, the houses of the palace complex were rebuilt every now and then. At the end of the 18th century, the number of aristocrats who inhabited the palace had strongly increased. In order to enable the construction of further houses, the hill of Analamanga was lowered by a good nine metres, reaching the present height of 1462 metres. 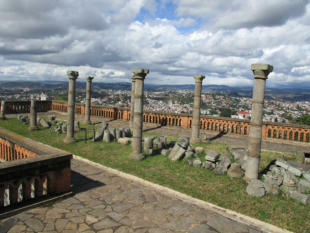 What nobody knew at that time: Analamanga became then the second highest hill of Antananarivo, behind Ambohimitsimbina. 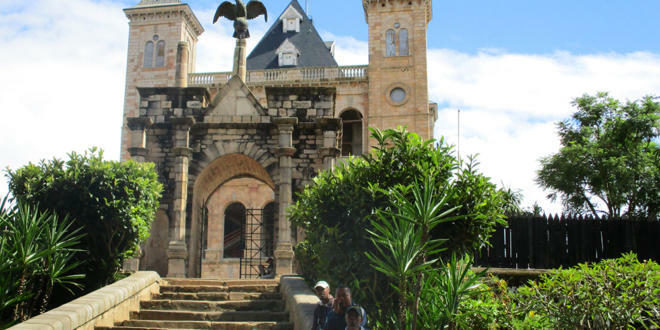 Under the famous King Andrianampoinimerina, the Rova in Antananarivo became in 1794 the centre of the largest kingdom of Madagascar at that time, while the royal hill of Ambohimanga, which had been used until then, only served as a spiritual seat. The Rova remained the seat of the kings of the Merina tribe until the 19th century. Under Andrianampoinimerina several buildings were added to the palace complex. He alternately used the houses built for him, Manjakamiadana (“where it is easy to govern”), Besakana and Marivolanitra (“under the sky”) as private houses. The latter is said to have had a staircase leading to a roof terrace – hence the name. Andrianampoinimerina is said to have sat there often and looked down on his kingdom. But also the other houses all had their own characteristics. The Manjakamiadana was actually a very simple wooden house, but silver sculptures were attached to all four corners of the roof: cast hands made from melted silver coins. Therefore the house was also called Felatanambola, “the silver hands”. Later the silver hands were built on the roofs of the Besakana. Another house was Bevato, translated “many stones”. As the name already indicates, it was built of stones, although this was completely atypical at the time of the kingdom of Merina. Manatsara is said to have been the most beautiful house, mainly because it was built of much harder and more resistant wood than the other buildings. A house called Manatsaralehibe (“great improvement”) could only be entered by the king alone. King Andrianampoinimerina had many wives and thus an enormously large family, and so most of the buildings of the Rova were occupied by relatives of the king. Mahitsielafanjaka, or Mahitsy for short, was the residence of one of the king’s wives. A valuable sampy (a magical talisman) was kept in her house to protect the king from evil people. The Mahitsy was therefore also a spiritually important house in which a rooster was sacrificed or ancestors questioned at certain festivities. Other women lived in the houses Nanjakana (“royal”), Tsarazoky (“good brother”), the old Masoandrotsiroa, Rarisambo (“fortified ship”) and Rarihasana (“armor of holiness”). Quite amusing is the fact that King Andrianampoinimerina’s first wife had to live in a building called Bado, which means “stupid”. King Andrianampoinimerina did not hesitate to transplant whole buildings. A custom that was later upheld. 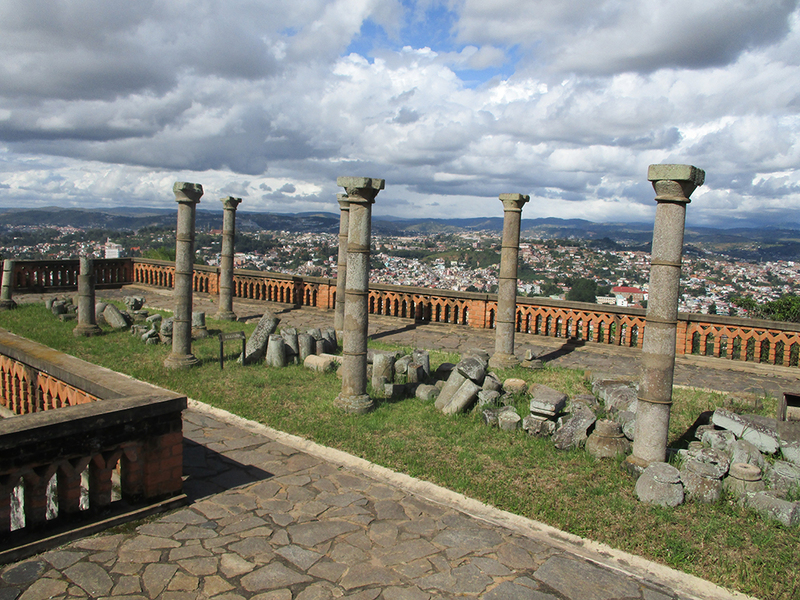 So the Miandrivola (“guardian of money”) migrated from the hill Ambohidrano to the Rova of Antananarivo. He also had the house Manatsara brought to the hill Ambohidrabibiy. The lively history of the palace complex was also continued among the subsequent kings and queens. Radama I., son and heir to the throne of the great king Andrianampoinimerina, invited after his travels to Toamasina the Creole merchant Louis Gros to modernize the house Bevato. His wife Rasalimo, an envoy of the Sakalava people and thus enormously important for peace in Madagascar, was to live there. Near Manjakamiadana a small wooden palace called Tranovola (in English “valuable house”) was built almost simultaneously in 1819, also under Gros’ supervision. 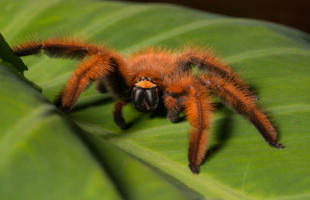 It is said to have been six metres long and a little more than seven metres wide. The name was given by silver ornaments on the house, the exact execution of which is not completely clear today, however, and varies depending on the source. Silver nails on the roof ridge, small mirrors on the outer walls, silver decoration on the window and door frames and small silver bells are said to have decorated the Tranovola. 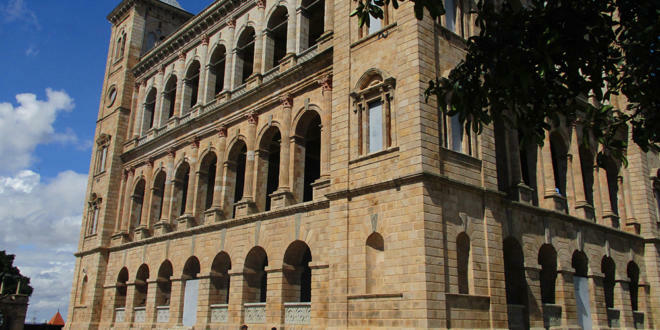 For the first time in the history of Madagascar, glass windows were used for the construction. 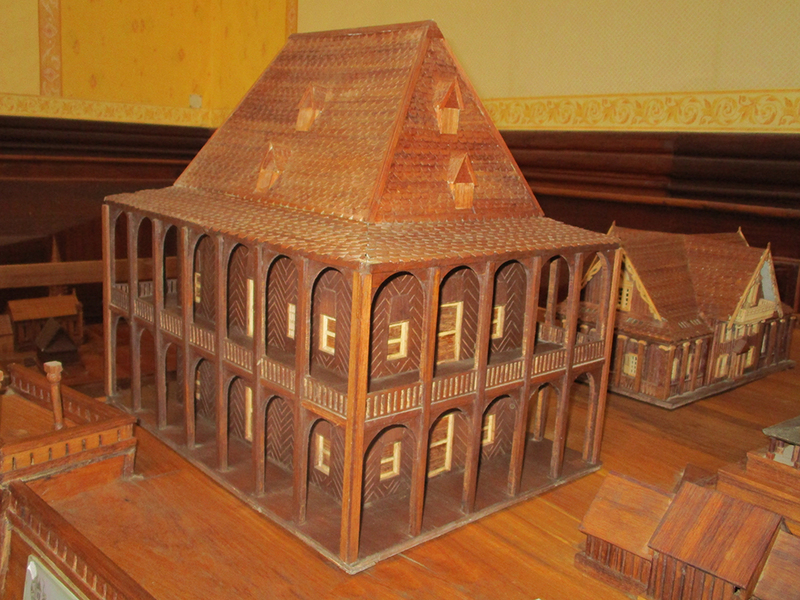 As the first two-storey house with small balconies and wooden shingles, the Tranovola inspired many Madagascans of the highlands to similarly design the architecture of their houses. Still today, the typical two-storey red clay houses with the small balconies in front of them can be found everywhere in the highlands. However, it is still unclear whether the rebuilt Bevato was the later Tranovola or both were independent houses of Rova. Under Radama I, the palace complex was slightly extended, and sharpened wooden posts were put around the entire Rova as a protective fence. He restored the Marivolanitra and used it as a guest house. Radama I himself lived with his wife, later Queen Ranavalona I, mainly in Besakana. 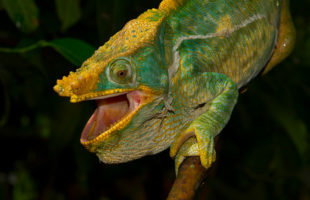 By the way, he had also taken care of his concubines: they were given their own house called Kelisoa, “little beauty”. 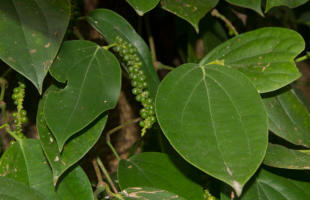 However, they had to share it with various sacred animals intended for sacrificial ceremonies. In 1820 Radama I ensured that the first school on the Rova was established in the house of Besakana. The school was run by the London Missionary Society and mainly taught the children of the royal family. Later, the school moved to the House of Bevato, allowing Besakana to be used again for its original purposes, such as coronation and lay-away ceremonies. When Queen Ranavalona I came to power in 1828, the face of Rova changed enormously. 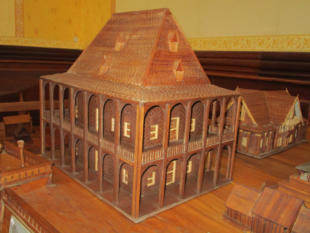 She had the largest house, the completely wooden Manjakamiadana, rebuilt by the Frenchman Jean Laborde between 1839 and 1840. It was 30 m long, 20 m wide and a good 37 m high. 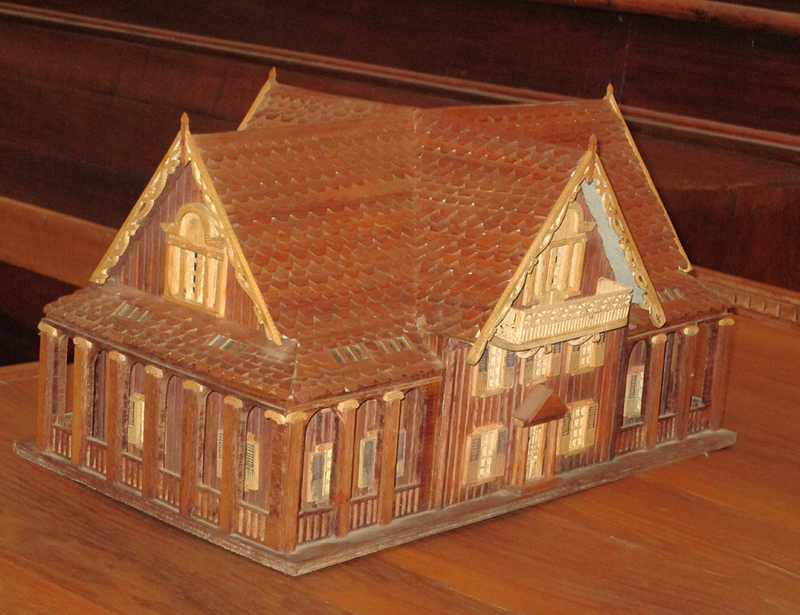 The roof alone was about 15 m high and was covered with hand-carved wooden shingles. 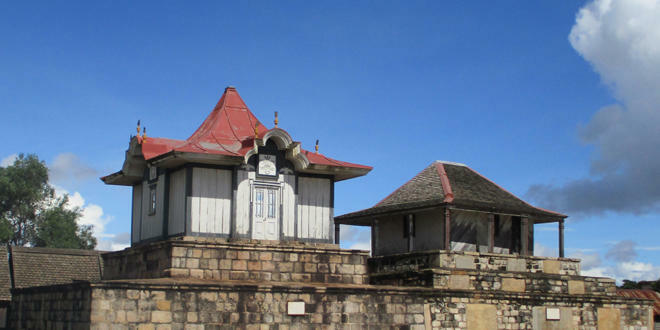 The outside walls were painted white by the queen, only the balconies were coloured red – both together represent the colours of the Merina. 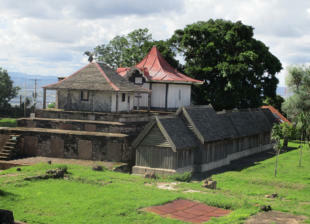 The Manjakamiadana served Ranavalona I as her own palace. To her son Radama II she assigned the house Tranovola, rebuilt by Jean Laborde, as his residence. It was also painted in red and white, but the other way round: the outer walls turned red, the balconies and the roof white. The boundaries of the Rova were greatly extended under Ranavalona I, so that the complex grew to its present size of about 7000 m². Instead of building more houses, Ranavalona I had some of the houses removed and rebuilt on other hills around Antananarivo. The house Voahangy, “the pearl”, was moved to Alasora. Tsiazompaniry, the “house that may not be desired”, came to Antanamalaza. The house Bado changed to the hill Ambohidrabiby and the houses Fohiloha, Kelisoa, Manatsara and Masoandro moved to Ambohimanga. In 1845 a stone gate was erected in the north of the palace complex according to designs by James Cameron, through which one still enters the Rova today. 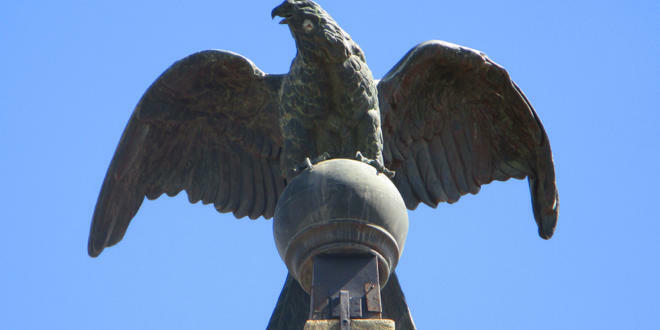 A bronze eagle, which Laborde had brought from France five years earlier, was placed above the stone stairs. For Ranavalona I a small palace called Tsarahafatra (“good news”) was also built. 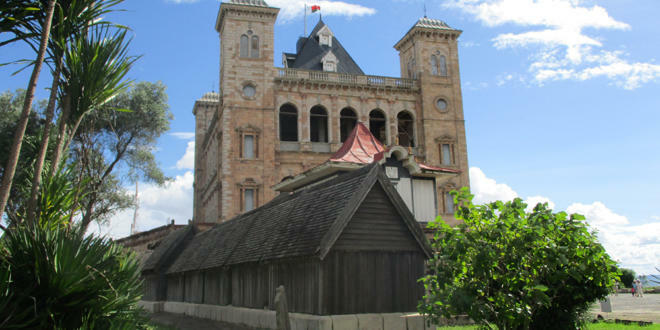 Queen Rasoaherina added the two-storey Manampisoa House from 1865 to 1867, whose name appropriately meant “adding something beautiful” and became her personal home. It had the basic shape of a cross, 19 metres long and nine metres wide, and had also been designed by James Cameron. The building itself had been supervised by William Pool. Rasoaherina removed the original Marivolanitra for her house and had it rebuilt on another hill. 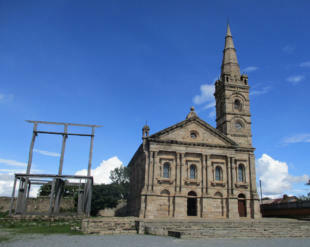 On the right the rebuilt church of Fionganana, on the left the first posts of the reconstruction of the house Besakana. In 1867 Ranavalona II ordered the Scottish missionary James Cameron to dress the Queen’s palace, Manjakamiadana, in stone. The wooden balconies had lost their stability over the years and had to be renewed regularly. 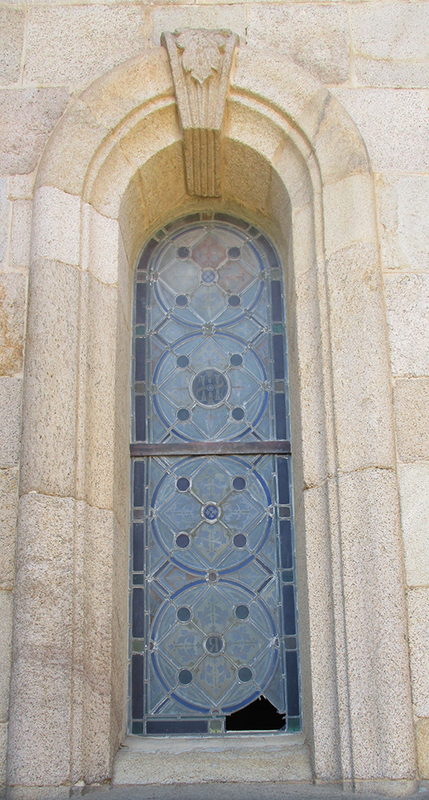 With the stone façade the queen hoped for a longer durability of her residence. With the reconstruction bells and a clock were attached to the house. 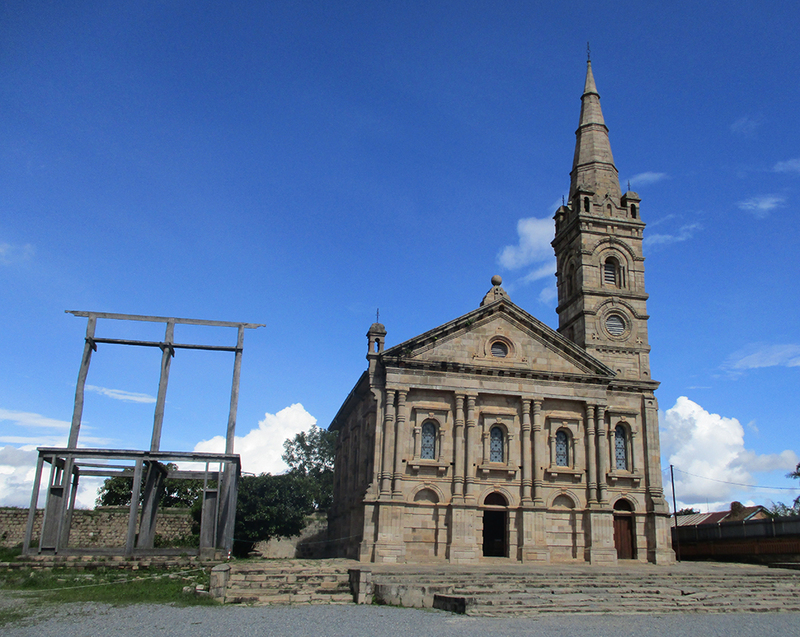 From 1869, a Protestant church called Fiangonana, designed by William Pool, was added to the palace complex, which can still be seen on the Rova today. It took eleven years to complete the church. Over 35,000 hand carved stones were used to build the 13 m wide and just over 18 m long church. 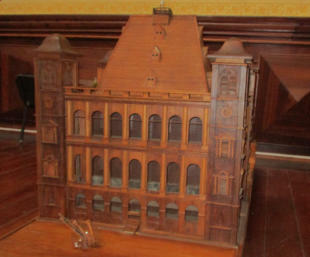 The royal family was given their own hand-carved wooden prayer chair inside the church, which can now be seen reconstructed. The 34 m high tower was the first building in Madagascar to be covered with slate shingles. 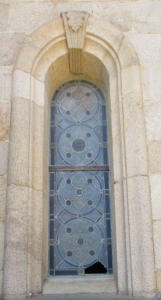 Of the original stained-glass windows imported from England, one is still preserved today, the others have been replaced by replicas. For the first time an organ was used in the Fiangonana to provide musical accompaniment to church services. With Ranavalona III, the reign of the Merina people on the Rova of Antananarivo ended. It was not even possible to build her own house on the Rova. The foundation walls of a building called Masoandro (“Sun”), named after other houses formerly located on the Rova, which were laid in 1893, were never completed. In 1895 French cannons destroyed the Tsarahafatra. The French colonial power finally banished Queen Ranavalona III into exile in 1896, where she died years later. Under the French colonial power the Rova lost massively in importance. The royal family and the remaining aristocrats were expelled from their homes. 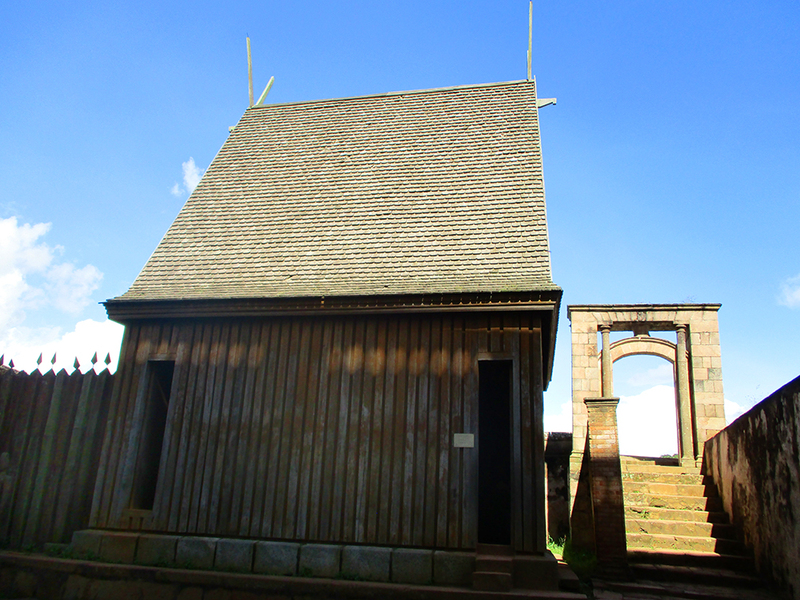 The graves Fitomiandalana were moved to the side of the graves of Radama I. and Rasoaherina and thus desecrated, and mortal remains of former royal families were transferred from the royal hill Ambohimanga to the Rova of Antananarivo. General Joseph Gallieni is said to have been significantly involved in these measures. They served above all to undermine the deep-rooted ancestor worship among the Madagascans and the very high sense of power associated with it in relation to the royal hill Ambohimanga and the royal palace of Antananarivo. Already one year after the assumption of power by France, the palace complex was only a museum that was not accessible to the public. The original wooden barricades around the Rova had been replaced by stone walls. The Manjakamiadana was used from then on temporarily for the training of officials in the so-called Ecole Le Myre des Vilers. The neighbouring Tranovola was used for the Académie Malgache, an institution for the study of linguistics, ethnology and sociology. 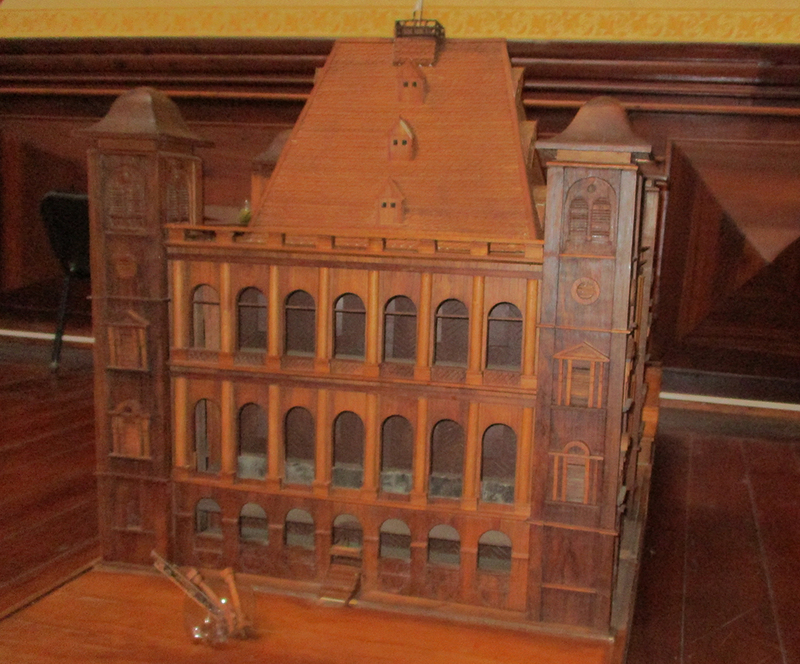 It later housed a palaeontological museum. 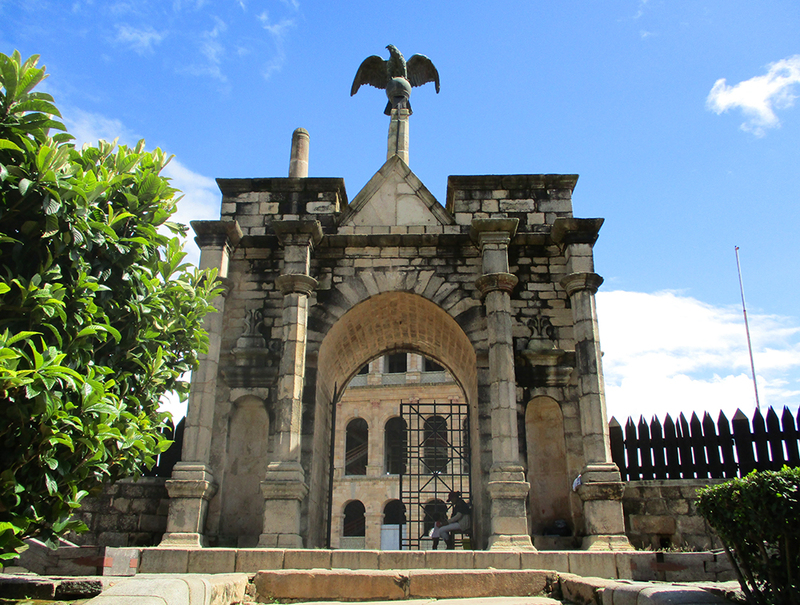 For almost a century, until the 1990s, long after Madagascar’s independence, the gates of Rova remained closed to the public and were only opened to privileged circles on a few occasions. In the 1960s, the last old wooden house built by King Andrianampoinimerina two centuries earlier disappeared. In 1995, the buildings of the Rova almost completely burned down. Only the stone facades of the royal palace and the church remained soot-blackened and threatened to collapse soon. The remaining six royal tombs as well as the houses Tranovola, Manjakamiadana, Mahitsielafanjaka, Manampisoa and Besakana had fallen to ashes. Less than 20% of the exhibits on display at that time were saved. Today they are in the palace of the Prime Minister, Andafiavaratra, only a few minutes walk from the palace of Rova. 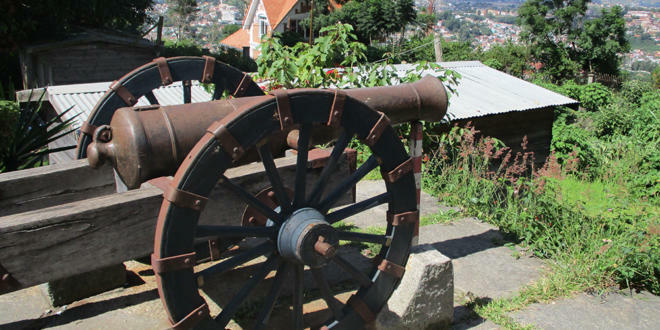 Shortly before the fire broke out, Rova should have been declared a UNESCO World Heritage Site – but the festivity could not take place and so the Rova of Antananarivo is still today, more than 20 years later, still not recognized as a UNESCO World Heritage Site. Whether the 1995 fire was an accident – as officially claimed – or possibly a politically motivated arson is still unclear today. The elaborate restoration of the stone walls and the reconstruction of the first wooden buildings lasted until 2010. In 2004, the western wall of the Manjakamiadana collapsed and threw the work back again. The reconstruction was decisively supported by foreign sponsors. Over ten million US dollars flowed into the renovation work – it is rumoured, however, that not all of it was used for the Rova. 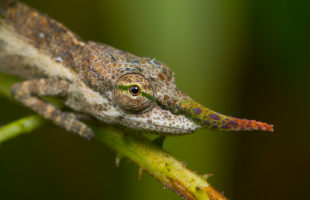 This would not be unusual for Madagascar either. 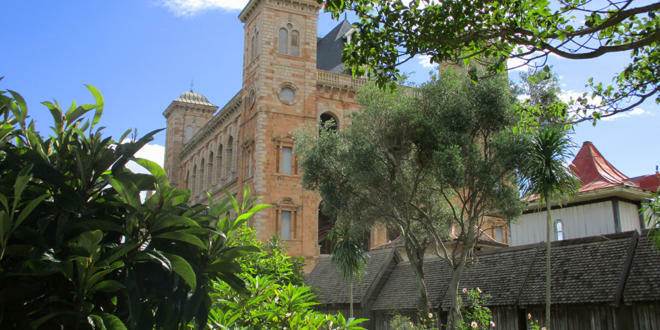 On the 50th anniversary of Madagascar’s independence, the Rova was finally opened to visitors again in 2010. To this day, however, it has not been completely restored. Only the church, the royal tombs as well as the houses Besakana and Mahitsielafanjaka were rebuilt. The Manjakamiadana, which can be seen far above the city, is unfortunately not accessible and has not been completely renovated until today – thick steel gates block the entrances. 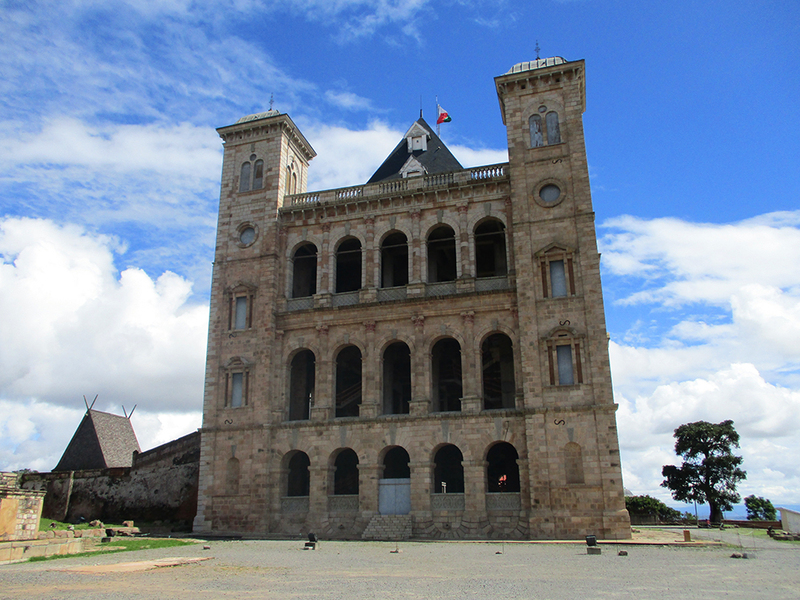 Nevertheless, the palace complex of Antananarivo is worth a visit, especially for historically and culturally interested travellers.